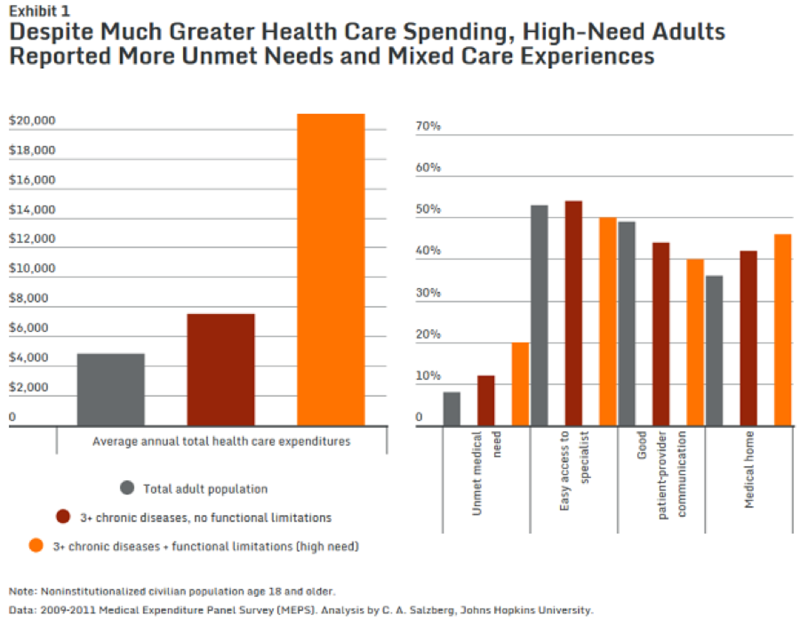 American adults with chronic illnesses that limit their ability to care for themselves spend more than $21,000 per person for health care, about four times the average for all adults. Despite that higher spending, however, a new analysis from the Commonwealth Fund finds that those with the greatest medical need — defined as people with at least three chronic diseases and a limited ability to care for themselves — were more likely than other patients to have delayed or done without medical care or a prescription, and they’re more likely to say that their doctors were disrespectful, didn’t spend enough time with them, or didn’t listen or explain things carefully. Nearly all (96 percent) of America’s high-needs adults have health insurance, but it’s not adequately providing for their care, the report found. High-need consumers tend to have lower incomes, and one in five reported going without or delaying medical care or prescription medication in the past year. The two top reasons cited by patients who had unmet health care needs last year were the cost of care and their insurers’ refusal to cover treatments. Those with private insurance were most likely to report unmet medical needs, while those with Medicare were the least likely. Those with private insurance were also the most likely to report poor communication with their doctor. “We shouldn’t assume that people with private insurance always have better insurance, particularly people with complex needs that are really sick,” says lead author Susan Hayes.